Off to the Fish Market! 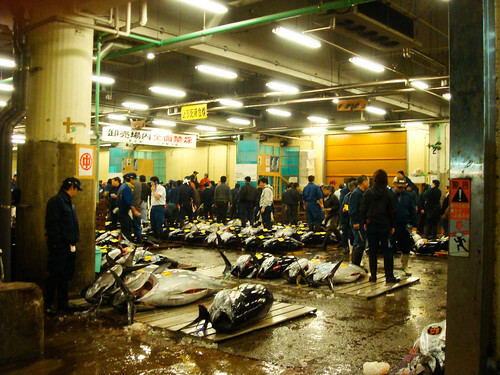 It's 4am and we're getting ready to head off to the Tsukiji Fish Market, which is one of the world's largest fish markets. If it weren't for jet lag there is no way I could ever get up this early back home. However, we will use our lack of sleep to our advantage! I can't wait to get my hands on some good fish! Just got into Tokyo a few hours ago. Took the JR from Narita out to our hotel in Ikebukuro and have basically been trying to get settled. Our room is really nice (small but nice) and is super quiet. Hard to believe there is so much hustle and bustle a few blocks from us. Both of us were drawn in by all the flashing lights, pachinko parlors and restaurants. But we wanted to try to turn in a little early so we can get ready for Tuskiji tomorrow morning. We still haven't planned all of our activities for tomorrow, but I have me a date with a big tuna!